Eden SuperBowl will be hosting some very exciting guests over the Christmas holidays. Join us on the 13th December from 2pm-6pm for some bowling and other fun activities - we’re hosting an interactive puppet show at 2pm with the talented Sean Briffa, where the audience doesn't just participate but also helps shape the story! 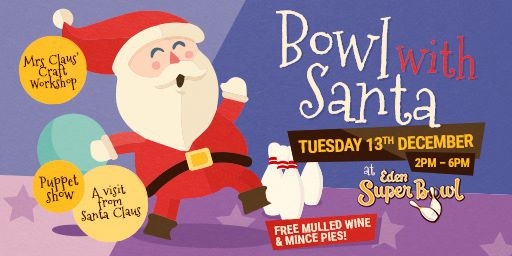 In the run up to this event, with every bowling game at Eden SuperBowl from the beginning of December till the 13th, every kid between 4 and 12 years old will receive a voucher for the crafts workshop being held on the 13th December between 4pm and 6pm. Because it’s not only kids that deserve a treat on Christmas, there will be mulled wine and mince pies for all bowlers to enjoy. Take a break from your Christmas shopping and head down to Eden SuperBowl for an afternoon full of Christmas cheer! Call us on 23710777 for more information or visit www.edensuperbowl.com to book your lane!